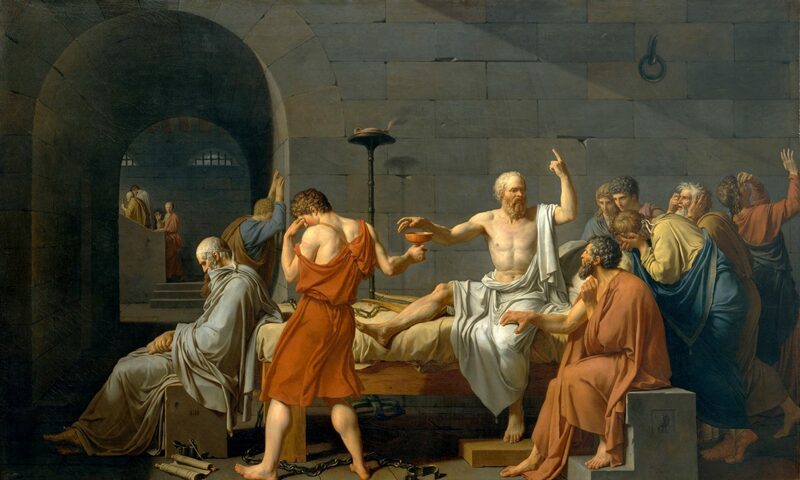 Under the research section, I’ve posted a link to my new article on Plato’s Euthyphro, which I consider to be an examination of the possibility of posing Socrates’ famous question, ti esti touto. It was just published in The St. John’s Review. The most famous Socratic question—ti esti touto?—is often preceded by a far less famous, but more fundamental question—esti touto ti? Though this question is posed in many dialogues with respect to myriad topics, in every instance it receives but one answer: it is something, namely something that is. The dialogue devoted to why this question always meets with an affirmative answer would appear to be the Parmenides, for there Parmenides throws into question whether the eidē are, only to establish that, if we have opinions that there is some unity in being, such unity must be. Nevertheless, the dramatic setting of the Parmenides is the quarreling of the Pre-Socratic schools, and the popular dismissal of philosophy that their quarreling engendered. For a dialogue that establishes that the object of inquiry is simply because we have opinions about it, we must, as I hope to show, turn to the Euthyphro. Under the research section, I’ve posted a link to my new article on Plato’s Theaetetus, which I argue can also be understood to follow the Sophist and Statesman, and thus in some sense serve as the unwritten dialogue, the Philosopher. It was just published in The International Journal of the Platonic Tradition 10: 151-167. This paper considers the unity of Socrates’ twin apparitions of sophist and statesman, alluded to in the Sophist. Examining how these apparitions are at work in the Theaetetus, I argue that the difficulty is that of combining the nurturing or educative role of the statesman with the sophist’s practice of refutation. Beginning from Socrates’ shift in appearance early in the dialogue, I argue that the cause of this shift is Theaetetus’ character, that this forces the general problem Socrates has in mind into a particular form, and that Theaetetus never fully grasps this fundamental, intractable problem. Consequently, the problem’s intractability shows why Socratic education is always refutative, and so combines the statesman and sophist’s respective arts. And because Theaetetus is the cause of Socrates’ shift, the philosopher’s appearance is always an ironic reflection of his interlocutor’s opinions: the dialogue the Philosopher would have to be named the Theaetetus. Under the research section, I’ve posted a link to my new article on Thales and Anaximander’s place relative to Hesiod and Heraclitus. It was just published in The Review of Metaphysics 70: 3-31. Praised for its reliance on observation rather than myth, the Milesian school signals the dawn of science in the West. Whereas Hesiod appeals to the long ago and far away to explain the here and now, Thales and his cohorts do the reverse. In this reversal, we are their thankful, even faithful heirs. But with Hesiod not everything is myth and hearsay. Indeed, Hesiod singles himself out by name as the bearer of a powerfully poetic and distinctly human wisdom that he consistently contrasts with Zeus’ divine wisdom. In this article, the author argues that the Milesians attempt to gain access to divine wisdom, and thus disregard the ambiguities characteristic of human wisdom. One sees this especially in a tension between Thales’ political wisdom and natural philosophy, and later between Anaximander’s cosmology and cosmogony. The author concludes that Heraclitus appears to have been the first thinker to confront the Hesiodic worldview on its own terms, inasmuch as his attempt to bridge the divide between divine and human wisdom always keeps one eye on the ambiguities that pervade human experience.